Siwash is a Cultivariable original variety, introduced in 2017, notable for high yield, heat-stable color, and tart flavor. Siwash is a very tart oca that cooks to a soft consistency. 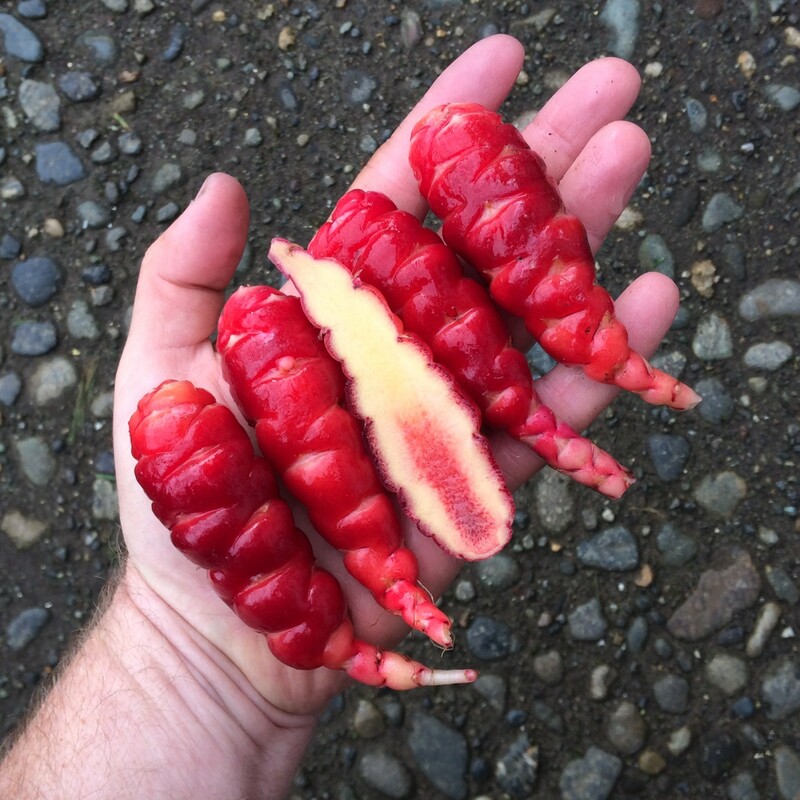 If you want to taste an oca that is about as far from potato flavor as you can get, this would be a good choice. Raw, it has attractive, shiny, deep red skin and yellow flesh with a red core. It can be sliced thinly for raw dishes, which will produce disks with contrasting red and white rings. It retains much of its color when cooked, becoming a pink/purple color. Siwash plants are tall and spreading, sprawling at maturity. Tubers are produced on short stolons and crowd together, often resulting in irregular shapes. Tuberization photoperiod is about 12.5 hours, roughly a week earlier than most heirloom varieties. Average yield is 2.2 pounds. The maximum tuber length is 4.7 inches inches and the average tuber length is 1.9 inches. Average tuber count is 38. There are roughly equal numbers of large and small tubers with this variety. Siwash is a heavy flowerer with a short-styled flower, flowering here July through September. It is consistently among the top three producers of true seed here, along with Redshift and Wishkah. You will receive the stated number of tubers, packaged in a wax envelope. We grade tubers by passing them through a grate. Small tubers are those that won't fall through a 1/3" grate, but that will fall through a 1 inch grate. Medium/large tubers are those that will not fall through a 1 inch grate.